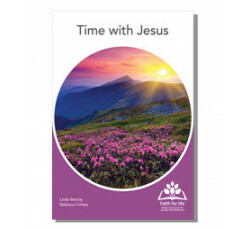 Time with Jesus is part of the Faith for life collection (Devotional series) and provides colourful, interactive devotional moments celebrating the life and teaching of Jesus. Read aloud from the Bible. Take time to consider a thought or question. Sing together or listen to the familiar hymn. Pray on your own or with someone. The 24 full colour A4 pages of Time with Jesus are printed on high-tech polymer stock for extra endurance.